We first found out about Armando Alvarez way back in February with a cryptic email. now we have a release date as well as the poster. 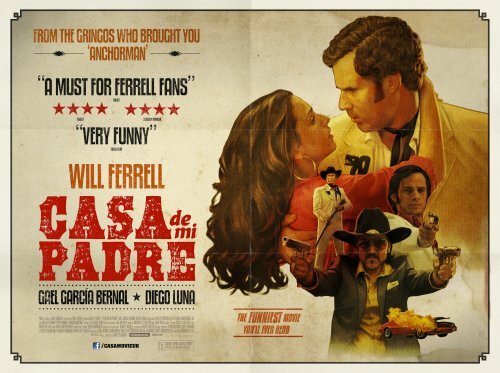 Armando Alvarez (Will Ferrell) has lived and worked on his father's ranch in Mexico his entire life. As the ranch encounters financial difficulties, Armando's younger brother Raul (Diego Luna), shows up with his new fiancée, Sonia (Genesis Rodriguez). It seems that Raul's success as an international businessman means the ranch's troubles are over as he pledges to settle all debts his father has incurred. But when Armando falls for Sonia, and Raul's business dealings turn out to be less than legit, all hell breaks loose as they find themselves in a war with Mexico's most feared drug lord, the mighty Onza (Gael García Bernal).